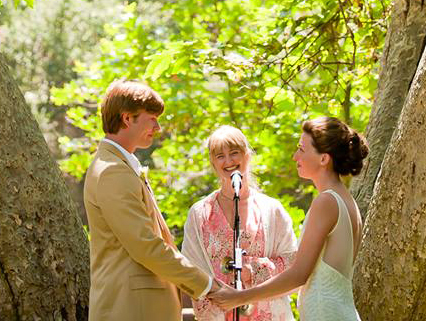 Diana Lang is an all-denominational minister and creates beautiful celebrations for your wedding day.This package includes an initial meeting and the writing and performing of the ceremony. The basic package is $5,000 for all ministerial services. Counseling, meetings, and travel outside the Los Angeles area are an additional fee. Please contact Diana for an appointment.
. . . A happy marriage is a long falling in love. It is a continuing courtship. It is a process of falling in love, again and again. It is a beautiful unfolding; a gorgeous expanding that opens the heart beyond any restrictions to greater and greater expressions of love. For love is the answer. Love is the conclusion. And in marriage, love is the practice, the exercise, that strengthens and sustains the heart. You begin in love, you return to love. It is a grand unfolding. This profound union that you perform today is an act of love. It says I believe in you and I believe in us together. It is a commitment to love.